Facebook is doubling down on a feature it introduced last year that lets users save web content to a private space on the social network for future reference. 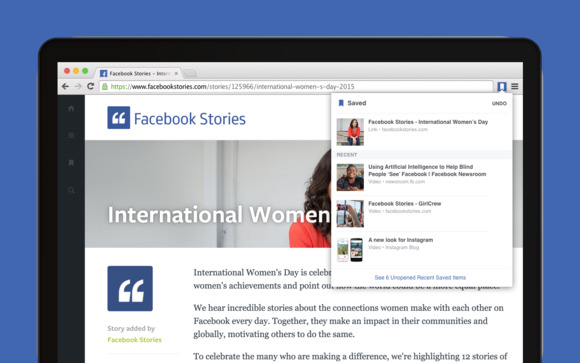 The company has launched a Chrome extension that adds a “Save to Facebook” button to Google’s browser. The extension allows people to save content to a private bookmark page on Facebook, which they can access from their profiles. On top of that, the social networking company also launched a Share on Facebook extension that allows users to share web pages with their friends by clicking another button inside Chrome. The extensions are direct strikes at Pinterest, which is trying to get more people to share and save content through its tile-based interface. According to Facebook, more than 300 million people use its saving feature every month. That figure may increase as a result of the new extension, since it will be even faster for people to add content. A comparison between the old and new like button styles. In addition to the new extensions, Facebook is changing its Like buttons on the web to do away with the Facebook logo and use the company’s iconic thumbs-up icon. According to the company, tests of the change showed that users liked content with the new buttons 6 percent more often. The Like, Send, Follow, Recommend, Save and Share buttons have been updated with a new design that’s supposed to be cleaner and flatter. According to Facebook, the new buttons are supposed to be backwards-compatible with all of the existing configurations that are currently in use. That’s good, since websites that already have those buttons embedded will start seeing the new look roll out over the coming weeks without any intervention.